For the vinaigrette, combine the vinegar and mustard in a bowl and whisk together. Slowly add in the oil while still whisking. Add the ground cloves and season with salt. For the drizzle, pour the balsamic vinegar into a small saucepan and bring to the boil over medium heat. Let the liquid reduce to a syrup consistency and remove from the heat. This should take about 10 minutes. Allow to cool. Remove the stones from the peaches and slice them into thin wedges. Toss the rocket and chard leaves in the vinaigrette and season with salt and pepper. 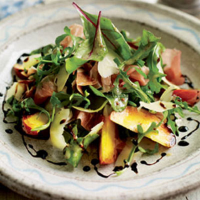 Add the peach slices, the thinly sliced ham and the Gruyère shavings and mix together gently. Place a generous pile in the centre of each plate and, using a spoon or squeezy bottle, drizzle the balsamic over the top of the salad. Place the slices of Parma ham in the freezer for about 10 minutes while the vinegar is reducing; this will make them easier to cut. Waitrose Solera Jerezana Manzanilla Sherry. Manzanilla Sherry is a fino and develops a distinctive salty tang. It makes a lovely apértif. Italia Prosecco Collezione NV, Italy. Made exclusively for Waitrose, this excellent Prosecco has light, fresh and fruity flavours of pear and citrus.